Shelley Glover ‘04 was a gregarious Burkie, who embodied a passion for excellence and an exemplary love of life. To the great sadness of her family and all of those who loved her, she passed away in 2004 from injuries sustained while training as a member of the U.S. Ski Team. 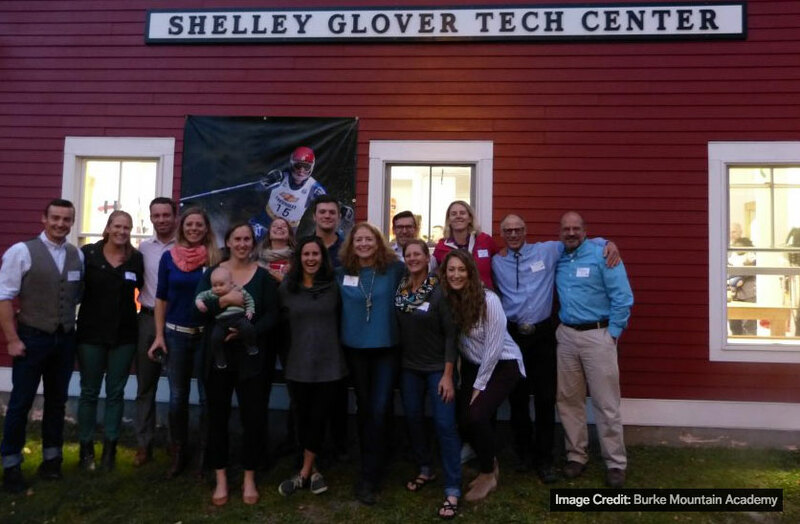 On Oct. 15, 2017, the Burke Mountain Academy community gathered as part of the annual Parents’ Weekend to celebrate Glover’s legacy through the inauguration of the Glover Tech Center (GTC) – a cutting-edge facility dedicated exclusively to ski racing equipment preparation. Thanks to a major investment of approximately $250,000 and following the successful recent opening of the Ronnie Berlack Center (RBC) – BMA’s best-in-class indoor training – the academy was in a position to completely redesign its former athletic training space to create a new infrastructure dedicated exclusively to ski racing equipment preparation. In addition to featuring individual ski lockers for each athlete as well an increased number of tuning benches equipped with safe, timer-operated electrical outlets thoughtfully hanging from the ceiling, one of the key highlights of the GTC is the Montana Saphir B Robot. The Montana Saphir B is a dual feed automated stone grinder designed specifically for race services. With it, we’re able to fully customize our grinds and structure patterns to best meet the needs of BMA athletes. The quality and consistency of the Montana stones produce consistently clean grinds, allowing bases to better take wax and get up to speed quicker than standard recreational shop machines. The Saphir allows us to control all equipment variables, bringing consistency and precision to BMA athletes resulting in better performance. “In a sport with so many variables, it’s important to control the few that we can. The resources in the new Glover Tech Center bring world-class ski tuning in-house to BMA athletes. We’re able to provide world-class tunes and new ski preps to our athletes to assure the highest level of quality and consistency,” said Steph Darling, GTC Director of Equipment and Tuning at BMA. “It’s exciting to carry on Shelley’s legacy, growing up racing with Shelley, I look forward to carrying on the traits I remember most about her, her positive energy, work ethic and taking care of the little details. It’s an honor to launch the BMA High Performance Equipment Initiative in the newly renovated GTC and I look forward to witnessing the growing success of our BMA athletes. What an exciting time to be a Burkie!” added the experienced technician who has more than 20 years in the ski racing industry including a few seasons on the FIS Ski Cross World Cup and Jeep Tours, and current owner and operator of her own elite ski tuning business, RTuning. Shelley was born in Madison, Wisconsin. She raced at Tyrol Basin Ski Area before attending BMA from 1999 to 2003. In 2002, she joined the U.S. Ski Team’s development team. That year, she was the Eastern Junior Olympics giant slalom champion in addition to achieving several top-five finishes in international-level (FIS) races. She passed away from injuries sustained in a ski training accident in 2004. Her legacy lives on through the Shelley Glover Foundation which seeks to increase access to athletic opportunities and competition, advocate for improved safety and injury prevention, improve the quality of life for children through participation in sports, and assist children in strengthening their physical and emotional health.